Beef bourguignon is a labor of love that is totally worth the effort. Slow-cooked beef in a red wine sauce with sweet pearl onions and earthy mushrooms is the ultimate winter comfort food. 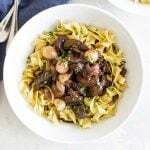 Plan to make the stew a day in advance (you can make the onions and mushrooms while the stew simmers) and keep it in the fridge overnight – it will continue to develop its flavor as it chills. Serve the stew on its own, with buttered egg noodles, or mashed potatoes. In an oven-safe pot (see notes) cook the bacon until it’s browned and the fat is rendered. Remove the bacon leaving the fat behind in the pan. Dry the beef thoroughly (otherwise, it won’t brown well) by patting it with a paper towel. Add the beef to the hot bacon fat and sear on all sides. Depending on the size of your pot you may need to do this in batches. Overcrowding the pan will make it difficult to get a nice sear on the beef. Once browned remove the beef from the pan and set aside. In the same pot, saute the sliced onion until softened and lightly browned. Add the tomato paste and stir until it’s coating the onion. Place the beef and bacon in the pot with the onion. Sprinkle the flour over the top and stir until it’s coating the beef and onions. Pour about 1/4 cup of the wine into the pan. As it simmers, scrape up the browned bits off the bottom of the pan. Add the rest of the wine and beef stock to the pan. Adjust the heat to medium-high and bring the liquid to a simmer. While you wait for it to simmer, add the garlic, thyme, parsley and bay leaf. Once the stew is simmering, cover the pot with a lid slightly askew, and transfer it to the oven. Simmer the stew for 3-4 hours in the oven (adjust the temperature up and down as needed) or until the beef is fork tender. Remove the beef from the stew and set aside. Using a fine-mesh sieve, strain the sauce into a saucepan, pressing on the solids to extract as much liquid as possible. Discard the solids. Bring the sauce to a simmer over medium heat. Simmer it for about ten minutes or until it has reduced and thickened enough to coat the back of a spoon. Add the beef to the sauce and stir. Transfer the beef and sauce to a container and store it in the refrigerator overnight. Melt the butter in a 10-inch skillet over medium heat. Add the thyme sprigs and the onions, stirring to coat them in the butter. Cook the onions until they start to brown and caramelize in spots. Add a 1/2 cup of water to the pan and cover it with a lid. Simmer the onions in the water for about 10 minutes. Uncover the pan and continue simmering the onions until most of the water has evaporated and the onions are tender. Season the onions with the salt, transfer them to a container and discard the thyme. In the same pan, melt the butter over medium heat. Add the mushrooms and sautee them in the butter until they’ve released their moisture and are a deep golden brown. Season them with salt and transfer them to a container. Store them in the refrigerator until you are ready to serve the stew. Combine the stew, mushrooms, and pearl onions in a pot. Warm it over medium heat. If needed, thin the stew with a few splashes of beef stock. Taste the stew and add more salt, if needed. It’s good to have a plan and I recommend making the stew first and, while it’s in the oven, make the pearl onions and mushrooms. Keep them in the refridgerator overnight and then warm them together the next day when you’re ready to serve the stew. Everyone has different ovens, stoves and cooking equipment so don’t take the cooking times listed as the law. Instead, use your senses and trust your gut – if the onions are lightly browned in less time for you, go with it. Just because there’s time left on the timer (or, in some cases, more time may be needed) doesn’t mean you follow it. Trust your gut and your senses. As far as pots and pans, I used an 8-quart stock pot to make the stew, and a 10-inch skillet for the pearl onions and mushrooms. Depending on the size pots and pans you use you may need to adjust some of the measurements and cooking times. I adapted this recipe from Julia Child’s famous recipe and you may notice a couple of big differences. First, I only used one pound of beef, which means my versions is a little soupier than the original. I like how it turned out – it produces four very generous helpings. Also, the original recipe calls for carrots which I left out. I chose to use fresh white pearl onions instead of frozen ones, which is a popular substitute. You will need to peel the onions first and this tutorial shows you how. The fresh pearl onions are worth it because once cooked, they literally melt in your mouth like candy. If you do decide to use frozen ones, just toss them in at the end after you’ve reduced the sauce and added it to the beef. They will warm quickly in the hot stew.